Imagine cleaning out an old, vine-covered work shed, and instead of finding the usual old junk, you walk through a door to the past? On a farm that has been owned by the same family since Revolutionary war times, that’s exactly what happened. In that small building, the rich history of a long-forgotten industry was unearthed, the products and tools of that trade left untouched for generations. The Reuben Hersey Toy and Box Shop had stood on Hersey Farm in Hingham, MA, waiting to be discovered, for over a century. In 2007, Peter Hersey, great grandson of Reuben Hersey 3rd, proprietor of the Toy and Box Shop, began restoring his family’s farm. The derelict outbuilding overlooking a bucolic pasture had been declared off-limits at least since his father was a child. Finally able to satisfy his curiosity about its contents, Peter struck off the old, rusted lock and opened the door. After clearing away some stored items, what he was astonished to see was a time capsule – an intact toy making and coopering shop. The toy shop on Hersey Farm is the last furnished cooper’s shop standing in Hingham, and more significantly, it is the only preindustrial toymaker’s shop still in existence in America. The shop is of local and national historical significance as a reminder of a vibrant industry. This discovery inspired renewed interest from historians in the famous coopering and toy making industries in Hingham, and is the catalyst for a new book on this chapter of Hingham history. More than 400 toymakers and coopers worked in Hingham, crafting wares that were sold all over the country. 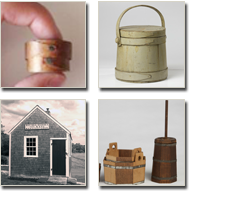 For the first time, the fascinating story of a lost trade is told in a beautifully photographed book, Bucket Town: Woodenware and Wooden Toys of Hingham, 1635-1945 by Derin Bray, a nationally recognized authority on American art and antiques. 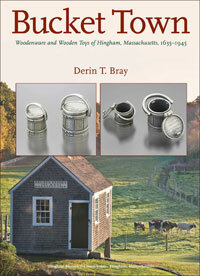 This meticulously researched book has just been published by the Hingham Historical Commission. Special Offer to Hingham Residents! 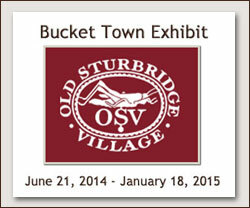 Old Sturbridge Village is hosting an accompanying exhibition from June 21, 2014 and to January 18, 2015 in the OSV Visitor Center Gallery. Come and see a recreation of the Reuben Hersey Toy and Box Shop, and watch coopers at work! Please browse through the history of this project. 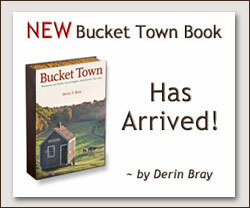 The book has just been published! Lindsay Malone, great great granddaughter of Reuben Hersey! 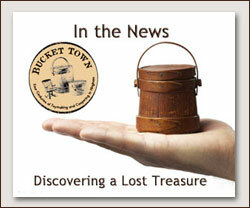 Sign up for Bucket Town News!